A few months ago, I visited El Titan de Bronze, a factory on Calle Ocho in Miami that’s small in size but big in prestige. 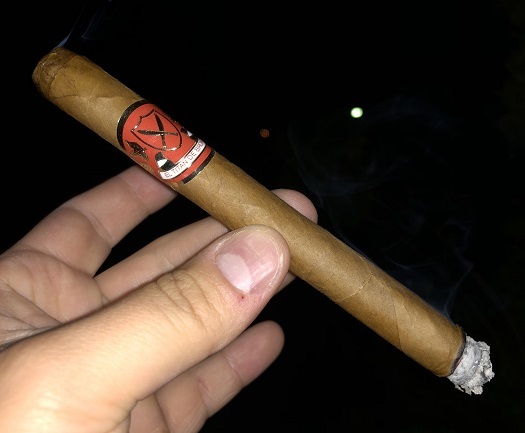 El Titan crafts cigars for such clients as Drew Estate, Warped Cigars, La Palina, Cornelius & Anthony, Padilla, El Primer Mundo, Cremo, and many others. Less well known are the operation’s house blends. Gold, for example, sports a Connecticut Shade wrapper around an Ecuadorian binder and filler tobaccos from Nicaragua and the Dominican Republic. As I recall, I paid about $8 for the Gold Lonsdale No. 1 (6.5 x 44). I love the size. The expertly constructed cigar boasts a medium-bodied profile of honey, cinnamon spice, oak, almond, and white pepper with a bready texture.